We will NEVER add you on Skype or PM you on the forums to ask you to click links, accept files, tell us your password. NEVER TELL ANYONE YOUR PASSWORD - EVER, EVER, EVER! There is NO such thing as a special link to get unbanned beyond appealing on our forums with THIS link OR if you are in the VERY rare situation of having an account banned from BEFORE WE HAD MUTES on the server you can go HERE. Be aware of FAKE skype account pretending to be owners/mods/friends. Our secure.hivemc.com website is protected by 128 bit encryption, and the website's identity is validated by an SSL certificate issued by Comodo, one of the worlds leading Internet Security providers. 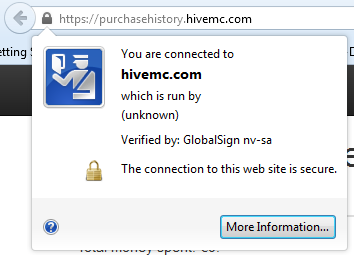 Any details entered at secure.hivemc.com are safe. We are aware of a number of users attempting to steal players account details by means of confidence tricks and phishing links. Please follow the information in this article to ensure that you aren't caught out. The first and most common method for these users trying to steal details is by contacting players via the fake Skype accounts - There are too many to list, the short part is NEVER trust the contact on Skype. The second method is random forum users sending links and PMs via our forums. The user congratulates you on becoming a moderator, or asks you whether you want to become a moderator and asks you to download a program and login with your Minecraft password, or login to a website with your Minecraft password. The links/files are usually named something like "hive-staff.exe" or "Staff Panel"
The user claims that you are going to be banned for an offense such as disrespecting an owner, spam, foul language etc, and tells you to login to a website with your Minecraft password to not be banned. The links/files are usually named something like "hive-bans.exe" or "Hive Ban Panel"
The user claims to be from the Hive Shop, offering discounts on products and sends you a false PayPal account. Entering your details into these programs or links WILL lead to your Minecraft account being stolen along with any other accounts that use the same email and password and potentially leave other programs running on your computer. In the case of a false Will Barlow (our Staff Manager) account, HE WILL HAVE VERIFIED WHICH SKYPE ACCOUNT HE WILL ADD YOU ON TO DISCUSS MOD APPLICATIONS AND INTERVIEWS. DO NOT ACCEPT ANYTHING ELSE. Another easy way to spot these is to keep an eye on the quality of English used. Most of the users sending these links do not speak English as a first language, and lack basic spelling and grammar in their messages. All of the staff members listed above are native English speakers, or speak it as fluently as if it was a first language. If you have received these PMs/downloaded the file already, run a virus scan immediately, change all of your passwords to all of your accounts (email, Skype, Minecraft, Facebook, YouTube, banking etc) and delete and block the user. If you see these links on the forums, use the "Report" functionality to alert the staff team immediately. Please be very careful, only accept Skype requests from players you know. Ask to talk to them on TeamSpeak or something to confirm that they really are who they say they are, and NEVER accept files via Skype from ANYONE. Similarly, do NOT trust bit.ly links posted on the forums unless you are absolutely certain that the user posting them is legitimate.